600 Sf Of Pistol Packin' Comfort. Keep Your Guests On The Hill. Available Now. THE BIG GUN CABIN is a 600 Sf property located in the center of historic downtown Foresthill California. This Cabin is part of Miner's Camp, a (10) Unit Nostalgic group of themed cabins, celebrating the rich history of the Gold Rush in Placer County and the Foresthill Divide. 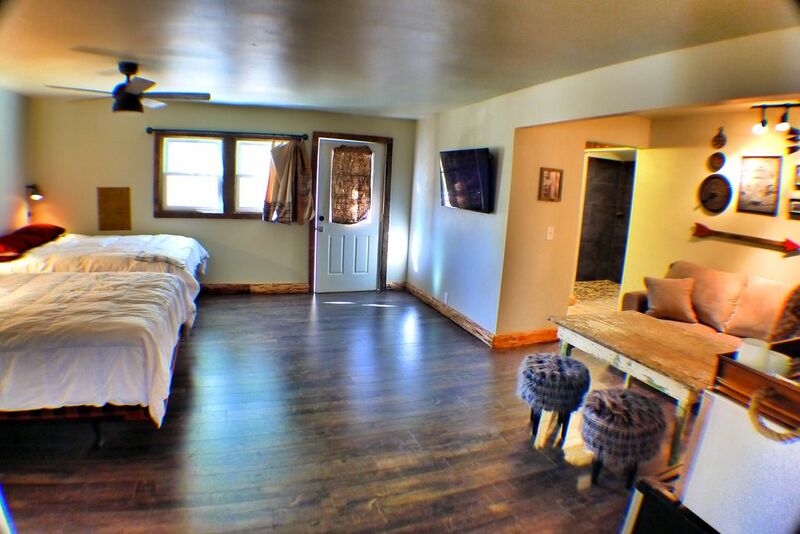 THE BIG GUN is an open floor plan with a large room consisting of (2) Queen Beds and (1) Sleeper Sofa. It can sleep (6) comfortably. It has a private bathroom. THE BIG GUN has an adjoining door to combine with THE TURKEY HILL cabin next door, creating a (3) room, (2) Bath, (5) Queen property. THE BIG GUN MINE was located in Michigan Bluff and was the last operating hydraulic mine in the United States. Michigan Bluff is one of the only locations in the word that produced 94% pure gold. Details are what makes Miner's Camp special. The owners are passionate about selecting the right materials to create an authentic experience. They pride themselves on "American Picking" and restoring most of the era furniture themselves. All interior work was completed by the hands of local craftsman and trade. Outside the cabin you will be able to tour mine carts and equipment that have been donated by locals to share the history of the divide with you and your family. Miner's Camp has relationships with local tour operators to enhance your stay with Gold Panning, White Water Rafting, Kayaking, Hiking, Biking, Equestrian and other Eco-Tourism activities. Double sink. Barn Door separates shower and toilet from sink. Located in Downtown Foresthill, just a short walk from Wedding Venues and Food options. Beautiful cabin, lovely grounds. Could not have asked for more. Hands down our stay was perfect!!! We needed a place that was wheelchair accessible and this cottage fit our needs 100%. It allowed us to attend a wedding at the Forest Hill Lodge which was only up the road about a 5 minute walk. I highly recommend these cottages. Brian was very accommodating and helpful in sending us the pictures of the ramp do we knew in advance it would all work out just fine. The cottage was very clean and the beds very comfortable. Thanks to Leif who also was very helpful!!!! The cabin worked well for our family. It was decorated nicely. The only complaint would be there wasn't any coffee cups. Pull the trigger on booking Big Gun Cabin! This place is awesome! We actually booked the adjoining cabin (Turkey Hill cabin) but the owners were so kind to offer this cabin since it is larger and we have twin toddlers. Owners respond quickly to email (or text once we made contact) and met us upon arrival (in the dark, snow and cold) to give us a warm welcome and tour. Cabin is clean and very stylish with a mix of modern (plush bedding, granite bathroom countertop with vessel sinks, 55 inch LED TV) with charming decor (stirrup hand towel holders, sliding barn door in bathroom, wooden crate nightstand). I can see this place being suitable for families (there's nothing there for my toddlers to break! ), seniors (it's all on one floor with walk in shower and ramp access to get in), people who like to kayak and hike and mountain bike plus for pet owners (our dog was happy!). You could do a girls weekend and rent the cabin next door. For any Western States people out there, we used to fill the water containers for the Duncan Canyon aid station just down the street. We took our kids to play in snow for the first time to a park just around the corner. I highly recommend this place! We hope to be back someday soon!